European vine growers need increasing support from technology to face challenges from the global market. Wine is a very important asset for European agriculture and economy at large. European wine producers now face strong competition from new wine makers from the rest of the world. Innovation in viticulture is of course very important in order to achieve higher and more homogeneous wine producing standards, enabling growers to better face the new challenges in the wine sector. The innovative VINTAGE decision support system (DSS) for vineyard monitoring and management aims at the integration of near real time field and remote sensing data to cover all aspects of vineyard management, using complex weather - soil moisture - crop growth - pest and disease modelling. The VINTAGE system relies heavily on data, models and software. Basically the idea is to provide growers with a clear and always updated view of their vineyard status as far as soil plant and weather conditions are concerned, i.e. in day-to-day management procedures: specific watering needs of each parcel, control of the growth phase of grapevines and grape ripening, limiting the usage of fertilizers and pesticides and increasing the quality of the final product. The VINTAGE DSS aims at increasing efficiency through an optimal management of the crop in the different vineyard areas. Furthermore, the DSS allows a holistic vision of all the vineyards vegetative behaviour, so that it is possible to monitor and improve quality having a “bird’s eye” vision of the status of the vineyards. VINTAGE uses weather data from wireless monitoring stations to measure air and soil temperature and humidity, together with a number of other variables important for the vine growth and development, such as solar radiation, rainfall and wind. Data are spatially interpolated over a fine grid, allowing to provide outputs and advice all over the wine growing areas involved and as input for computational agro-models. VINTAGE pilot sites are located in Piemonte (Italy), Bourgogne (France), Rioja (Spain), and Douro (Portugal). VINTAGE involves intensive use of remote sensing data from satellites and from unmanned vehicles to get a detailed view of vine greenness, soil surface moisture and other variables relevant to vineyard management. More specifically microwave remote sensing data are being used to provide a continuous and complete coverage of surface soil moisture. 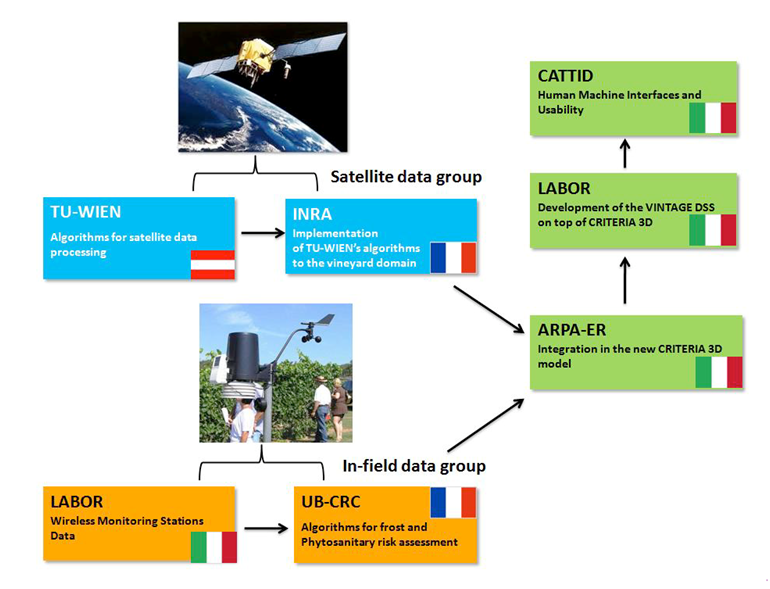 At different spatial resolutions and quality levels, satellite-derived datasets will be used at kilometric resolution, where the potential of METOP ASCAT data and SMOS MIRAS observations will be investigated for use in viticulture. Since spatial resolution is rather coarse (in the order of kilometres) but temporal resolution rather high (daily observations), downscaling of these datasets tailored to the agro-meteorological model and the decision support system is needed. At hectometric resolution, ENVISAT ASAR data are used for the generation of a continuous soil moisture data stream at 150m resolution. The potential of the upcoming ESA’s Sentinel-1 satellites carrying SAR sensors for land surface monitoring will be considered as well. Besides, it is envisaged to test the added-value of soil moisture products for the DSS (e.g. anomaly-maps from mean or long-term trends). Optical data are also one of the main components for the VINTAGE system to monitor crop conditions. This is achieved at three spatial resolutions. At hectometric resolution, Sentinel-3 and PROBA-V observations will be used to document the landscape composition that will be used for the up-scaling of local meteorological measurements in combination with other information including the topography. At decametric resolution, Sentinel-2 observations will play a key role for the monitoring of vineyard fields along the growing season. The reflectance signal will be transformed into biophysical variables (LAI, FAPAR, FCOVER) taking into account the specific canopy structure of the vine, exploiting some ancillary information such as row orientation, row spacing and height. The resulting variables will be used to assess the vigour of the crop as well as for the validation/correction of crop functioning models. At decimetric resolution thanks to UAV observations, mostly targeting the intra-field variability by focusing on the structural properties of the canopy (row orientation, height and width of the row, cover fraction, nature of the inter-row (bare or with grass) and on the spectral properties of the row and allowing to be more independent on the nature of the inter-row. This can be used both for precision viticulture and precision harvesting. A high degree of complementary exists between these three levels of observations, the higher spatial resolution providing key information for the calibration and validation of the lower spatial resolution products.